Imagine this, you spend a good 6-8 hours at your office and come back home with an aching body. As a regular office worker, does this sound appealing? Here’s the root of your office pains and discomfort: Wrong office chairs. A range of elements is involved in the art of office sitting and seating than meets the eye. In order to score high on both, comfort as well as productivity levels, it is imperative to invest in good ergonomic office chairs. The science of ergonomics takes into consideration the factors that affect the workplace efficiency of an individual. 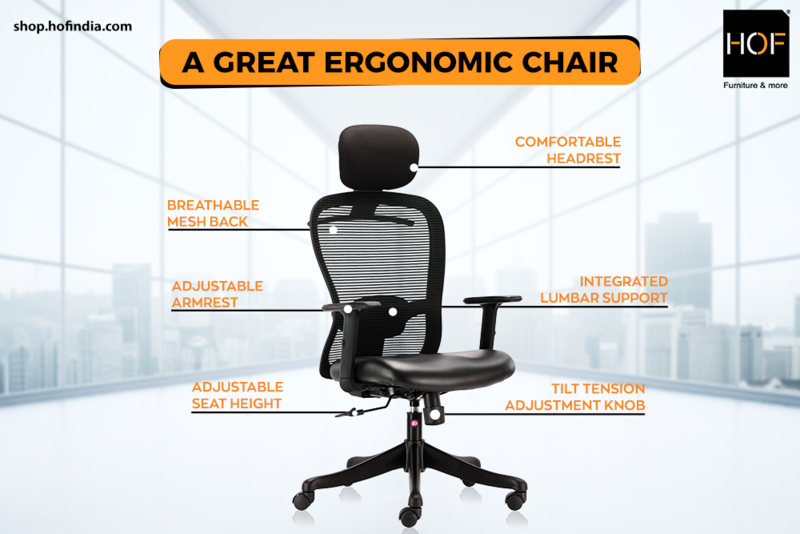 Ergonomic office chairs are designed to be adjustable, supportive and effective for all types of body structures. They are well-fitted and made from premium quality to prevent workplace injury. Ergonomically designed seating takes 2 important components into consideration: the way people sit and the proper method of seating. A major proportion of sitting equipment in offices are devoid of critical support for the seater’s neck, shoulders and spine. These problems can cause acute back and body pain resulting in workplace injuries over a course of time. Designer chairs that are ergonomic help avoid these issues by providing lumbar support to ensure proper posture and alignment. These office chairs also have armrests to reduce strain on the neck and shoulders along with support for the legs. All ergonomic office chairs are adjustable and can accommodate all shapes and sizes for correct seating. The best ergonomic chairs are made to suit the user’s needs in all possible ways. They render full support to varied body types by enabling the ability to adjust completely. Since these office chairs are designed scientifically, they promote natural body movement instead of forceful movement in unnatural ways. This makes finishing tasks quicker and boosts job performance as ergonomic chairs are easy to adjust and use without causing harm to the user seated. A good chair becomes a great chair when it is able to fulfil all of the above and the user is able to work effectively and efficiently without any injury or discomfort. Now that you have understood the meaning and significance of good workplace seating, visit shop.hofindia.com today to get your hands on the country’s top quality ergonomic office chairs!